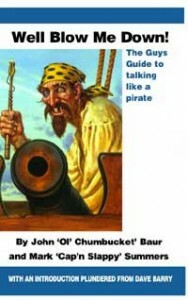 Newcomers to Talk Like a Pirate Day will find this book wonderfully entertaining and informative. The authors delve into the hows and whys of their unusual holiday, complete with a mini-dictionary, Talk Like a Pirate Day tips for various situations (clubs, work, church…), biographies of famous pirates (both historical and fictional), and several other worthwhile tidbits. Pirate veterans will find much of this to be familiar territory, but will still enjoy reading of the Pirate Guys own experiences and future plans for their holiday. And everything is of course brimming with their unique sense of humor, which really shouldn’t be missed. Whatever your interest in Talk Like a Pirate Day – be it an excuse to go drinking with your mates (like some,) or an excuse to spend the other 364 days of the year buying pirate costume bits and decorations (like me), Well Blow Me Down! is a worthy addition to any household, bookmobile, or Ivy League College required-reading list. This entry was posted in Books and tagged baur, humor, self-help, summers, talk like a pirate by Bilgemunky. Bookmark the permalink.